Debbie looked at the phone that was too big for her to hold, unsure of what the doctor meant, but proceeded to relay the call to her deaf mother. From the look on her mother’s face, she knew the news was not good. Debbie was seven years old. My sister Debbie is hearing. My parents, Sid and Barbara Ander and I are deaf. Our family has three generations of deaf members, Debbie being the only hearing one in our immediate family. 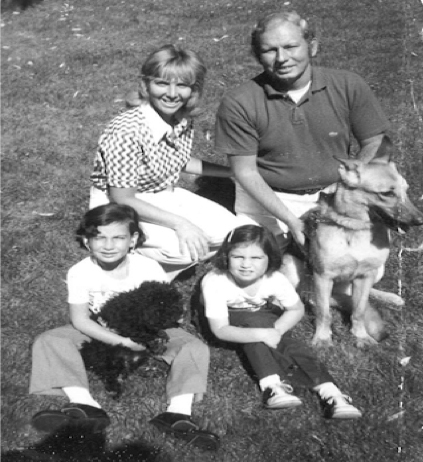 Debbie and I had a normal childhood, except that, Debbie was the family’s ears and voice. Since the age of four, Debbie interpreted for our parents, translating between spoken English and sign language. Due to the lack of telephone access for the deaf, Debbie often relayed conversations between hearing people and our parents on the telephone before she was old enough to understand what they were saying. At the time in the early 1970s there were no legal protections or civil rights for the deaf. Thankfully, my parents would not wait until a law providing civil rights to them was passed. They believed in the right of every individual to have equal access, and saw an opportunity to make change in their own community, long before the signing of the Americans with Disabilities Act (ADA) in 1990. Sid and Barbara understood the battle for equal access as they lived in it on a daily basis. They lived most of their lives without their rights being written in legislation. They started a company in their kitchen to develop and market products that would not only make lives easier for the deaf and hard of hearing but the lives of their children and families. They were among the first to market a telecommunications device for the deaf (TDD) which allowed those who are deaf to communicate through the telephone. For every person or company that acquired a TDD, there was one less person a deaf person would have depend on to make a phone call. They could order their own pizzas, check on a credit card billing or make a doctors appointment. Additionally, they manufactured assistive technology products that made homes, apartments, hotels and motels safe and accessible for the deaf. Those products include visual and tactile alerts via a flashing strobe light and/or a vibration mode when a specific source is triggered like a doorbell or a fire alarm. Growing up, little did we know this was unique to America and that our parents played a role in paving the way for businesses to become more accessible to those who are deaf. Contrary to the expectations of many, the passage of the ADA did not automatically make the world accessible for everyone. For instance, one requirement of the ADA was to mandate a certain number of rooms in hotels and motels to be accessible to those who are deaf or disabled. However, there was often heavy resistance and lack of understanding as to the necessity of providing access. Debbie and I clearly remember our father asking every hotel he stayed in for a hotel communication kit. Without one, a deaf person was unable to know if housekeeping was at the door or coming in the room, use the telephone in case of an emergency or get a wake up call. They would not know if there was a fire or emergency in the hotel, because no matter how loud the alarms in the hotels were, they were never going to hear them. My parents had no intention of wanting to depend on Debbie or hotel employees to notify them in the event of a fire. The responses varied from an outright “no” to the provision of a dental kit (as in the American Dental Association) in lieu of an ADA accessibility kit to a wake-up note being slipped under our dad’s hotel room door when he needed a wake up call, causing him to miss his plane. Not only does the campaign for access create a more accessible society for many of us, these advances benefit society as a whole. For instance, it would be very hard to enjoy television programming at the gym or airports without closed captioning. Furthermore, it can be safely assumed that many of us, including those who use strollers and heels, would prefer to curb cuts (those wonderful indents where one sidewalk ends to cross a street and another sidewalk begins) as opposed to regular curbs. Another recent example of new technology that will have widespread impact is the development of text to 911 capability. This is where people can use text to contact emergency authorities. One can assume that this will come in handy in many situations whether you are deaf or hearing. It is our hope that in the near future no seven-year-old child will ever have to interpret a phone call and that the battle for access will be a thing of the past. *Debbie is currently the Vice President of Global Development at Krown Manufacturing, the very company founded by Sid and Barbara Ander. Alexis is a civil rights lawyer who is currently working in the world of technology to create a new level of access for the deaf and hard of hearing community.